This exhibited machine sadly suffered at the hands of careless shippers, receiving some damage on its way to the museum. The damage to the machine was unfortunately functional as well as cosmetic. While the cosmetic damage is somewhat repairable, the real difficulty is in determining what damage was caused to the operability of the machine. When received, one Nixie tube was shattered, three others would not light up, and the machine was not responsive to keyboard input. The shattered Nixie tube was replaced with an exact replacement, courtesy of a fellow calculator enthusiast, Brent Hilpert. Over time, I've found that a number of the circuit boards had small fractures in them (due to the rough handling in shipment), causing some circuit traces to be broken. Upon carefully inspecting each board with a backlight and repairing the fractures found, the three initially non-working Nixie tubes are working again. After quite a bit of electronic detective work, the machine is now almost completely operational, with incorrect display of multiplication problems on entry, and problems with the error/overflow detection circuitry. In the process of working through the problems with the machine, I've also been doing some reverse-engineering. Even though I've been somewhat successful in resurrecting the machine, I'd love to find more information on it. 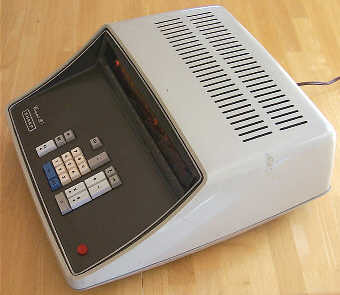 If anyone out there has service experience or documentation (such as Service Manuals, Schematics, or Operation's Guides) for this or similar-appearing Sharp, Facit or Addo calculators, or if you have one of these machines in operating condition, I'd greatly appreciate hearing from you. Click HERE to send me an EMail message. The Compet 20 is the second model of electronic calculator that Sharp produced for consumer use, and marked the beginning of Sharp's second generation of electronic calculators. 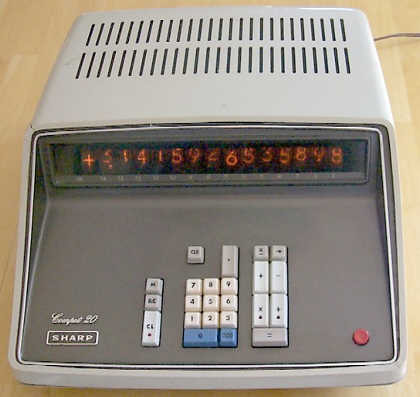 Sharp's first electronic calculator, the Compet 10 (Model CS-10A), introduced in June of 1964, is claimed as the world's first all-transistor electronic calculator, a fact which is disputable, as there were other transistorized electronic calculators introduced at around the same time. While Sharp's Compet 10 was indeed among the earliest of the all-transistor electronic calculators, there is some contention as to who was really first. IME in Italy, and Mathatronics and Friden in the US all made introductions of solid-state electronic calculators at around the same time in 1964. Any of these companies could lay claim to the title of "first", but with differences in definition as to the meaning of "formal introduction", "announcement", or "first customer shipment" and similar marketing-related terms, the claim of first really has no true significance. From a historical standpoint, it should suffice that Sharp did indeed produce one of the earliest all-electronic calculators. The Compet 20 was both a redesign and improvement on the Compet 10, relying on advances in transistor technology as well as miniaturization, to reduce the size and increase the reliability of the machine. The Compet 20 was introduced in September of 1965, about a year and a half after the introduction of the Compet 10. 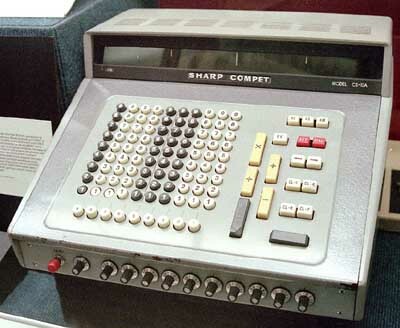 In November of the same year, Sharp introduced a higher-end version of the Compet 20, called the Compet 21 (Model CS-21A) that added automatic calculation of square roots. The Compet 20 and 21 are visually identical. The difference between them is additional circuitry in the Compet 21 to provide the square root function (that calculates square roots to six digits behind the decimal point), which is activated by pressing the [÷] key, immediately followed by the [=] key, a trick that Sharp continued to use for quite some time in order to save the cost of an additional keyswitch and keycap for the square root function. 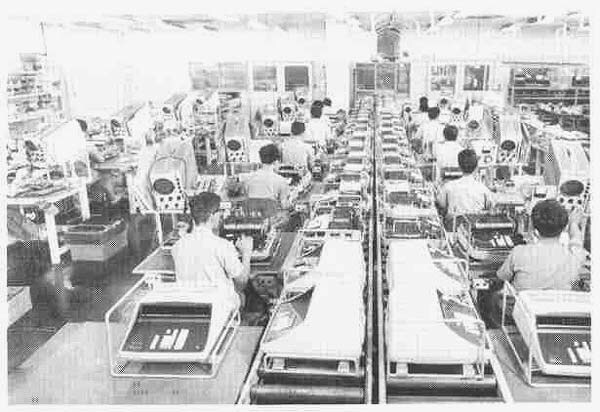 Near the end of the Sharp Compet assembly line, circa 1967. The Compet 10 used Germanium transistors that suffered from reliability and longevity issues because early Japanese-made Germanium transistors had some issues with moisture (from ambient humidity) getting into the transistor, causing contamination, which caused the transistor to fail. 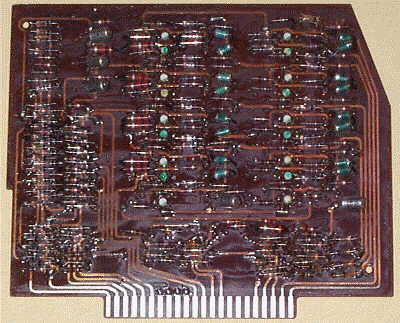 The Compet 20 used Silicon transistors, which were smaller, faster, and consumed less power, combined with the fact that Silicon is more stable than Germanium, improved reliability. Along with the benefits of Silicon transistors, Japanese transistor manufacturers (primarily NEC, Hitachi, and Toshiba) had gained a great deal of experience in semiconductor manufacturing during the time between the introduction of the Compet 10 and the Compet 20, which certainly also contributed to improved reliability. The Compet 20 also improved upon the Compet 10 with a ten-key keyboard versus the full keyboard arrangement (a column of 1 through 9 keys for each digit entered) that was used on the Compet 10. As early as the mid-60's, the Swedish company Facit, a powerful force in the European mechanical calculator market, had an OEM relationship with Sharp for electronic calculators for sale into Facit's European marketplace. Facit sold calculators under its name that were designed and had major subassemblies were manufactured by Sharp. Facit's machines had minor variances in features and color scheme. For example, the Facit 1121 is Facit's version of the Compet 20. The 1121 has 16 digits of capacity versus the 14 digits of the Compet 20, but the Facit lacks the  key of the Compet 20. Functionally, the two machines operate the same, and from a circuitry perspective, the machines share a common electronic architecture. 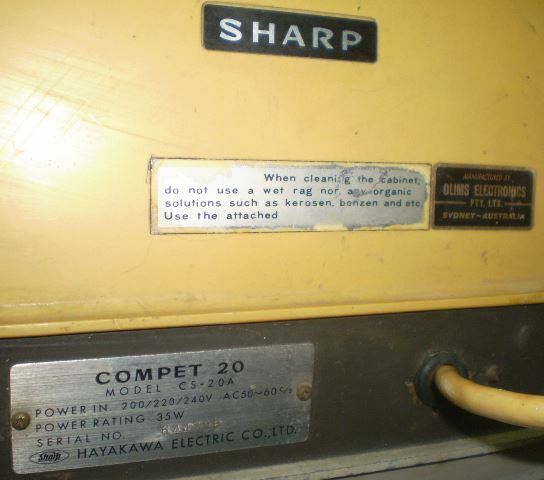 Sharp Compet 20 with "Manufactured by Olims Electronics" tag. Along with Sharp's OEM relationship with Facit, Sharp also had a licensing agreement with the Australian electronics firm Olims Electronics, headquartered in Sydney. Olims Electronics was the leading manufacturer of consumer electronics for the Australian market. In 1963, Olims formed a relationship with Sharp to manufacture small transistorized television sets designed by Sharp for distribution and sale within Australia. Expanding on this successful relationship, in 1966, Olims became an OEM customer of Sharp for it's electronic calculators, officially beginning with the Compet 20. However, unofficially, there were also a limited number of earlier Compet 10's (shipped to Olims Electronics in completed form, and re-worked by Olims Electronics for use on the Australian power grid) that made it to Olims for sale in Australia once the agreement was signed. 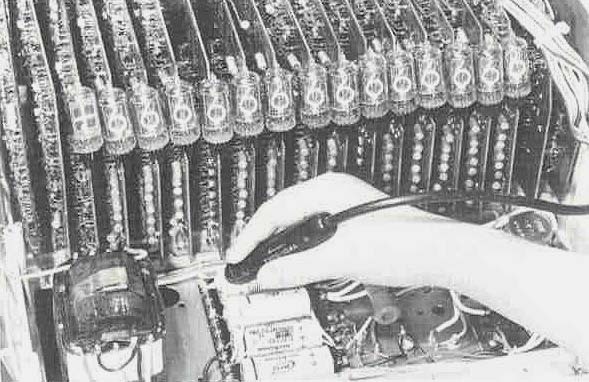 The major assemblies for the Compet 20 (circuit boards, keyboard, chassis components, cabinet electronic components, backplane, and power supply) were shipped to Olims Electronics from Japan, and Olims Electronics would assemble the machines in their factory, placing a tag on the finished product stating "Manufactured by Olims Electronics, PTY, Ltd.". Olims Electronics was responsible for all marketing, distribution and support of the Sharp calculators in Australia. The company performed all maintenance and repair services for the calculators in their shops. The Sharp calculators were extremely successful in Australia, and both companies profited well as a result of this arrangement. The exhibited Compet 20, serial number 711901, was manufactured in January of 1967 by Sharp in Japan. The museum also has a second, non-functional Compet 20 that was produced in September of 1967. It appears that there were no significant changes in design during that timespan, as all aspects of the machines from the circuit boards to the mechanical components are for all intents and purposes identical. The Compet 20 is a fairly basic four-function electronic calculator. 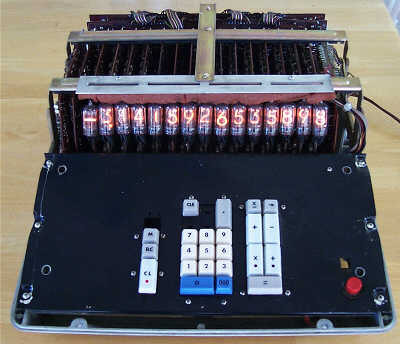 It has a 14-digit (plus a 15th sign digit) Nixie-tube display. The digit Nixie tubes indicate 0 through 9, and also include a right-hand decimal point. There is no leading zero suppression, but the machine does have floating decimal point (and a 'fixed' point mode determined by the setting of the [M] key, explained later). Add and subtract operations work adding-machine style, with the [+] key actually performing a "+=", and the [-] key performing a "-=" operation, even though the keycap nomenclature doesn't indicate this. The [=] key is only used to generate results for multiplication and division operations. The exhibited machine has a fault with the multiply operation, though it still gives correct answers. As yet, I have not been able to determine the cause of this fault. Due to this fault, this Compet 20 displays multiplication problems in a strange way. The multiplicand is first entered, then the [X] key is pressed. A red indicator lights up on the [X] key to indicate a multiplication is in progress, and the Nixie display after the last digit of the multiplicand lights up both the 7 and 9 digits at the same time (see photo above). Then, the multiplier is entered, and the display shifts all of the digits to the left for each digit of the multiplier entered. The resulting display looks rather odd, with the multiplicand and multiplier all on the display at the same time, separated by this odd looking digit with both 7 and 9 lit simultaneously. The [=] key is then pressed, and the product is correctly calculated and displayed. A correctly-operating Compet 20 would simply reset the display to all zeroes after the [X] key is pressed, with the multiplier showing up on the display as it is entered, and when the [=] key is pressed, the multiplication is performed, and the result displayed. Division on the Compet 20 operates as expected, also with an indicator in the [÷] keycap like on the [X] key that lights up when the dividend has been entered and the machine is waiting for the divisor to be entered, followed by the [=] key to obtain the result. The Nixie tubes are left active during calculations, and during some of the longer calculations (though the machine is quite fast) the numbers in the display dance quite a jig while such operations are in progress. The [M] key is a "push to latch, push again to unlatch" switch that changes the way that decimal point positioning is handled. When the [M] key is not activated, the calculator operates in full floating decimal mode. When the [M] key is locked down, the decimal point position is determined by where the user enters the decimal point in the first number of a calculation. For example, with the [M] key depressed, entering 1 divided by 2 will result in 0. However, performing 1.00 divided by 2 will result in 0.50; and performing 1.00000 divided by 2 will result in 0.50000. The [X-] key (with the - located under the X on the keycap) appears to work the same as the [X] key, except that the multiplier is negated. The [RC] key recalls the last number entered, for example, If you perform a 12 [+] 13 [RC], the 12 will return to the display, though if the [+] key is pressed after the [RC] key, the answer of 25 will be displayed. The Compet 20 also has a [→] key that deletes the last digit entered; a thoughtful addition that many early calculators (and many even today) lack. Lastly, the unusual  key causes entry of three zeros into the currently entered number. For example, pressing  [.] would result in "+0000000002.0005" in the display. It's not entirely clear why this key was included. If anyone knows why, I'd love to hear from you. As part of the effort to resurrect the machine, I have been working on instrumenting the electronics as well as reverse engineering partial schematics of the machine to try to better understand how it works. As a result of this work, I've come to some assumptions about the general technology and operating principles of the machine. All of the technical information included here is based on these observations and assumptions. The Compet 20 is built entirely with discrete transistor technology. There are no integrated circuits anywhere in the machine. Transistors are used for all active circuitry, including flip-flops, level shifters, gating, and display drivers. An assortment of different types of transistors are used, including some unusual transistors packaged in small white ceramic-cased "pancakes". These show up in the photos as white dots, some with green or yellow markings on them. These tiny transistors are part of the reason that the Compet 20 is a significantly more compact machine than its predecessor, as well as smaller than many of the competing machines on the market at the time. These devices were manufactured by Nippon Electric Co. (NEC) in Japan, and were called "Micro Disk" transistors. Diode circuitry is used for logic gating functions. The machine appears to have been designed using standardized circuits, with the same basic core of parts for flip-flops and gates, with component variances occurring in cases where different drive or input requirements exist. The machine appears to use two different sets of logic levels...one set of levels for use on-board, and another set of voltages used for communications across the backplane. For on-board logic, +10V represents a 1, and near ground represents a 0. For backplane levels, +4.5 to +5 volts represents a 1, and ground represents a 0. It isn't clear to why the backplane logic levels are different than the on-board logic levels. The brains of the machine are made up of twenty (perhaps this number is reflected in the model number of the machine?) circuit boards that plug into a hand-wired backplane. Two large boards are located at the rear of the machine, spanning the width of the cabinet. These boards, based on nomenclature found on one of them, form the sequencing logic for the machine. One of these boards, labeled "PROGRAM" is populated primarily with a large number of diodes, while the other has a board, labeled "A.P. ", consists of a number of flip flops, combinatorial logic, and decoders. It is assumed from this arrangement that this machine is microcoded to a degree, with the PROGRAM board serving as a ROM (Read Only Memory) containing "subroutines" (Sharp's language) that are micro-operations that govern the sequencing of the machine, and the "A.P." board as the sequencer which steps the machine through the micro-operations. If this assumption is correct, Sharp probably can lay claim to the first all-transistor microcoded electronic calculator. A microcoded architecture for such calculating equipment makes for a lot of flexibility. If the microinstruction set and its execution engine are properly designed, it becomes a fairly simple matter to make modifications to the behavior or functions of the machine without having the re-design the whole thing. 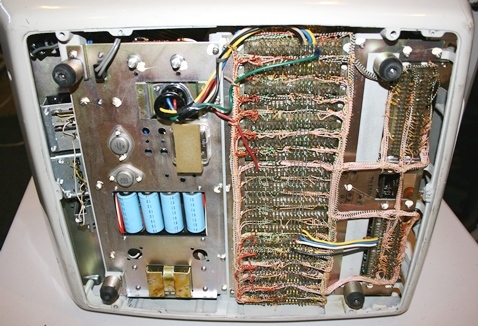 The flexibility of this design is what made it a relatively simple operation to modify the Compet 20 to perform the square root operation, which ended up becoming the Compet 21, as well as providing some flexibility in feature sets, allowing the Facit calculators to use the same architecture (and in many cases, the same circuit boards), but have some minor differences in function for brand uniqueness. 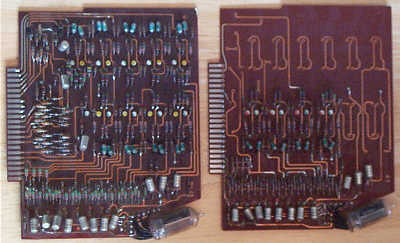 The remaining 18 boards are smaller than the program boards, and are plugged into the backplane perpendicular to the program boards. Fourteen of these boards are what I refer to as "digit" boards. Each digit board contains four flip-flops connected in FIFO (First In, First Out) shift register fashion which serve to hold the BCD (binary-coded decimal) digit to be displayed at that digit position; an array of diode/resistor gates that serve to decode the BCD number stored in the 4-bit register into a 1 of 10 selector; and finally, driver transistors (2SC287) which switch on the appropriate digit in the Nixie tube based on the outputs of the decoder logic. The Nixie tube is mounted directly to the board, situated so that it is properly positioned to shine through the display window in the keyboard bezel. This parallel digit design, where each Nixie tube has its own display decoding and driving circuitry, is much more straightforward to design and troubleshoot than multiplexed displays, but costs significantly more to manufacture because many more parts are required. The remainder of the real-estate on the digit boards is dedicated to what I call a breadboard area, where up to 8 flip flops and various gating functions can be built up. This breadboard area is where the working registers, data path, and switching circuitry resides, distributed throughout all of the digit boards, with interconnections through the backplane. A 15th digit board has a special Nixie tube (NEC CD-59) that contains only a "+" and a "-", used for indicating the sign of the number in the display. The rightmost card in in the cage is the keyboard interface. This card has an edge connector at its top edge that provides the connection for the wiring harness from the keyboard. This card provides keyboard encoding and signal conditioning from the switch contacts that make up the keyboard. The two left-most cards in the cage are pretty tightly packed with parts, and appear to be glue boards which contain numerous functions, including decimal point logic and drivers and error/overflow detection and lockout. The calculator uses a conventional linear power supply. Voltages produced are +12, -12, and +5.25 volts, along with +185V (used for driving the Nixie tubes). The +5.25 Volt and +12 Volt supplies are transistor regulated. The Compet 20 is actually a fairly fast calculator for its time. Compared to the Friden 130, the Compet 20 is a speed-demon. Addition and subtraction are return virtually instantaneous results. The worst-case multiplication takes about 1/4 second (999999 X 999999), and thirteen 9's divided by 1 takes about 1/3 second. Note that in the "all nines" calculations, the full capacity of the calculator is not exercised. As with many early electronic calculators, the Compet 20 gives incorrect answers when the most-significant (14th) digit of an operand is non-zero. Typically this behavior is related to the fact that one of the digits in the accumulator is used as a single-digit counter for counting up or down (up for division and down for multiplication) as each digit of the multiplier or quotient are used/generated during multiplication and division operations. 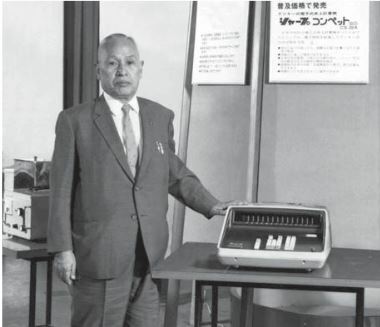 Thanks to Mr. Iwase and Mr. Kamiya of Sharp Corporation for information on introduction dates of early Sharp calculators. Sincere thanks to Brent Hilpert for providing a replacement NEC CD-65 Nixie tube to replace the original tube damaged in shipping.